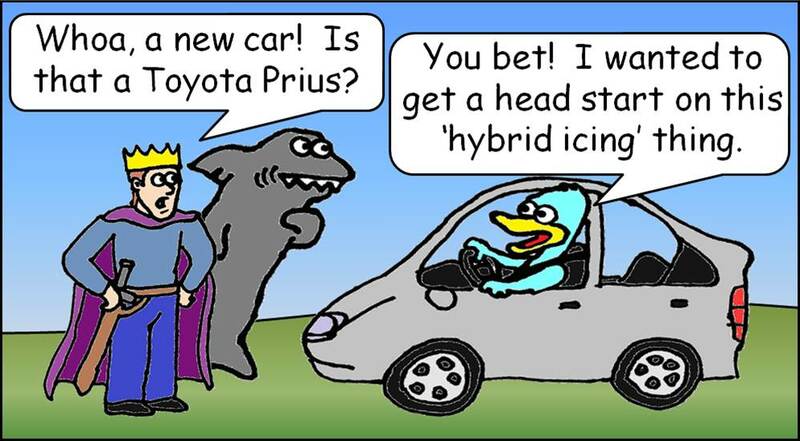 Hybrid Icing will be tested in the 2013 – 14 NHL preseason. This mixture of touch no-touch icing could be implemented for this regular season if the trial goes well. 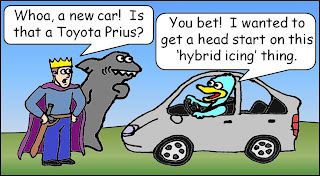 As for the timing of possible implementation, NHLPA board will vote on hybrid icing toward the end of the 2013 exhibition campaign. If it passes, it then goes to the NHL Board of Governors. If that passes, hybrid icing is in for 2013-14. The rules surrounding icing can be difficult for those new to hockey or for the casual follower to understand. Icing occurs when a player shoots the puck across both the center red line and the opposing team's goal line, and the puck remains untouched. It is, however, not icing if the puck is shot from behind the halfway line into the goal, or when the shot must be played by the opposing team's goaltender to keep it out of the net. In the former case with a shot puck crossing the goal line completely, the goal is counted. A major exception is when a team is shorthanded. A team trying to kill a penalty may legally "ice the puck". A team on a power play, however, must still follow the icing rules. When icing occurs, a linesman stops play. Play is resumed with a faceoff in the defending zone of the team that committed the infraction. The icing rule has been around since September 1937. It was introduced to eliminate a common delaying tactic used by teams to protect a winning margin. One historic example of the kind of tactics that led to the inception of the rule was a 1931 game between the Boston Bruins and the New York Americans. The Americans, protecting a 3-2 lead over the Bruins at Boston Garden, iced the puck over 50 times. The crowd became incensed and threw debris onto the ice, causing a delay while the teams were sent to their dressing rooms. When the teams met again that December 3 in New York, the Bruins iced the puck 87 times in a scoreless draw. The rule has been amended several times since. The 1951 amendment stipulated that if the goaltender touched the puck, the infraction was nullified. The 1990-91 season, saw the league amended it to nullify the infraction if the puck passed through or touched the goal crease when the goaltender had been removed for an extra attacker. Coming out of the 2004-05 Lockout, an important icing rule modification was made. After some teams in need of a player substitution began deliberately icing the puck to stop play, the NHL supplemented the icing rule prior to the 2005-06 season by not allowing the offending team to substitute players before the next faceoff, except to replace an injured player or when the goaltender must return to the net following an icing call. This change was made in an effort to speed up game play by reducing icing infractions, as well as to encourage teams to work the puck up the ice rather than taking the opportunity to rest their players. In the NHL, a player on the opposing team, other than the goaltender, must touch the puck to cause the stoppage of play. This is called touch icing. If the puck is first touched by the goaltender or a player on the team that iced the puck, icing is waved off (cancelled) and play continues. 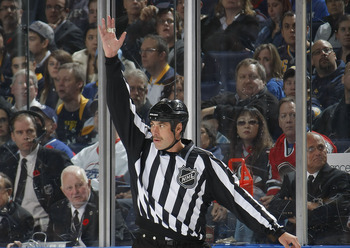 While an icing call is pending, the linesman raises an arm to indicate that a potential icing call may be made. If the icing is waved off, the official lowers his arm and gives the washout signal (similar to the "safe" sign in baseball). Automatic or no-touch icing occurs in IIHF and European Professional rules. Play is stopped for icing immediately once the puck crosses the goal line. This rule has been adopted after an incident in1990 when a Czechoslovakian player was rushing to get to the puck in an icing situation, crashed into the boards, suffered severe spinal injuries, and died a few weeks later. Hybrid icing is a mixture of touch and no-touch icing that gives discretion to linesmen. This type of icing is intended to eliminate some of the violent crashes into the boards that happen with touch icing while still allowing the team that iced the puck to get to it first and have the icing waved off. In this variation of icing, play is stopped immediately if the player on the opposing team reaches the faceoff dot first, instead of skating all the way across the goal line to touch the puck. Hybrid icing is a mixture of touch and no-touch icing. It gives a linesman the discretion to blow his whistle and stop the play if he believes a defending player will reach the puck first. If the linesman believes the attacking player has a chance to reach the puck first, he keeps his whistle in his pocket and lets the race to the puck play out. The linesman always will side with the defending player and blow his whistle if he feels the race is a tie by the time the players reach the faceoff dots. At 29 years old, Joni Pitkanen will miss the entire 2013-14 season due to an injury suffered in the spring when he raced down the ice in an attempt to beat an icing call. 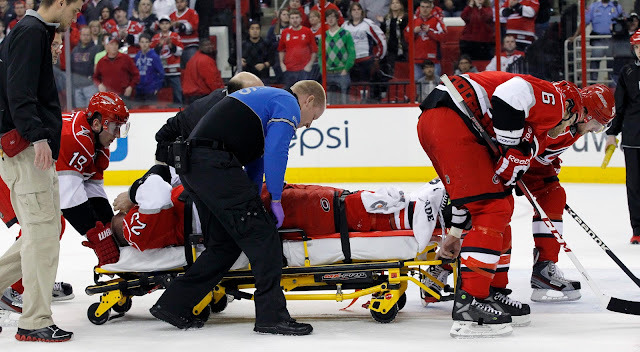 Back on April 2, the Hurricanes defense man crashed into the boards, feet first, after getting tripped up while chasing a loose puck for a potential icing call in a game. Pitkanen’s calcaneus (heel) was broken in more than a half dozen places, and he spent the off-season unsuccessfully attempting to recover from what is often one of the most devastating injuries for a hockey player. His career could be over. This is exactly the type of play that has pushed the NHL to finally begin testing the use of a hybrid icing rule this preseason.